Artist's impression of the planetary system around the red dwarf Gliese 581. The five Earth-mass planet (seen in foreground - Gliese 581 c) is just inside the habitable zone. Planets around small mass stars may only have a billion-year window during which life can form. This is the implication of research into the tidal forces that can pull a planet into a tighter orbit around a star. The so-called habitable zone around a star is loosely defined as planetary orbits in which water would be liquid, not vapor or solid, on the planets’ surface. These orbits are closer-in for smaller (less bright) stars. However, habitability is not a permanent property of a planet. "For some planets around low mass stars, they are not going to hang around in the habitable zone forever," says Rory Barnes of the Lunar and Planetary Institute at the University of Arizona. "They are going to be pulled out." The pulling is due to tidal forces that arise because the gravitational attraction between planet and star is not uniform over their surfaces. Barnes and his colleagues have shown that the tidal forces around a small mass star can draw a planet from the habitable zone on the order of a billion years, as reported in a recent issue of Astrobiology Journal. If some of these migrating planets can be detected, they could provide a test of the Gaia hypothesis, which says that life can force changes to a planet in order to keep it in a habitable state. Migration of planets is thought to be common-place around stars during the first few million years after they form. This is due to interactions between planets and a short-lived dusk-filled disk. However, migration by tidal forces is different and happens over much longer time-scales, Barnes says. Just as the moon causes a rise in the Earth's oceans due to its non-uniform gravitational attraction, a planet will cause a tidal "bulge" to appear on the surface of its star. If the planet is revolving faster than the star is rotating, this stellar bulge provides a drag on the planet that causes it to lose energy and fall closer in towards the star. The rate of this inward migration depends on how eccentric, or non-circular, a planet's orbit is. The researchers calculate that planets with eccentricities greater than 0.5 are vulnerable to this effect (the Earth has an eccentricity of 0.017). Roughly 20 percent of known exoplanets have eccentricities that are this high, Barnes says. Barnes and his collaborators are the first to look at how tidal migration might cut short the habitability of a planet. "We are looking at the overlap of the habitable zone and where tidal effects matter," Barnes says. For big stars with masses more than 35 percent of our sun, there is no overlap. In this case, tidal migration occurs only for planets that start out relatively close to the star – too close to be in the habitable zone. The situation is different for low mass stars. Here, planets with highly eccentric orbits that start out in the habitable zone will eventually move closer to their central star. The increase in radiation due to this inward spiral will raise temperatures above the boiling point of water, endangering whatever life might have formed. The researchers have looked at various scenarios and shown that the habitable lifetime around low mass stars can be less than one billion years. If life can originate on one of these migrating planets, can it survive the increase in radiation as the planet moves out of the traditionally defined habitable zone? Answering this question could provide a laboratory for studying the Gaia hypothesis, which says life can alter a planet's climate and geochemistry to better suit life. "It provides a grand picture of evolution," Barnes says. If astronomers could detect a biosignature (such as an unstable mixture of atmospheric gases) on a planet that had migrated out of the habitable zone, then this might imply that the planet's biology had altered the planet – maybe by increasing the reflectivity of the atmosphere – in order to survive. These migrating planets "might tell us something about how life mitigates disasters and adapts to climate change," Barnes says. 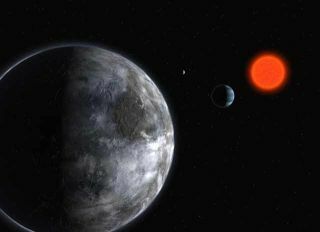 The researchers applied their analysis to the planetary system around the red dwarf Gliese 581, whose mass is one third that of our sun. Recently, three planets have been discovered around this low mass star, and one of them (Gliese 581 c) is just inside the habitable zone. The researchers wondered whether Gliese 581 c might have once been in the habitable zone and then later migrated out. It turns out the answer is probably no, but Barnes is confident that eventually astronomers will find a planet whose habitability has been cut short. Can a Biosphere Be Selfish?